Warning: Do not read any further if you are intimidated by ‘Change’. For those who haven’t listened to him yet, I suggest taking the risk. But there’s one disadvantage. You’ll never get enough out of his music. His song and breath are one. He is busy exploring uncharted territories of vocal sounds. He makes you sing with him when he’s on stage. 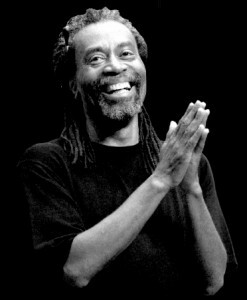 Yes, he is Bobby McFerrin! Born on 11 March, 1950 as Robert McFerrin to musician parents, in New York City, he was always surrounded by tunes, rhythms and most importantly, people from different musical backgrounds. Known for creating polyphonic effects in his songs and his ability of multiphonic singing, he creates special effects in his songs using his mouth and by tapping on his chest. Being a musician, songwriter, producer, conductor and an arranger, Bobby believes that music is more about the audience than the performer. When his 1988 hit song “Don’t Worry, Be Happy” was used in George H. W. Bush’s 1988 U.S. presidential election as the official presidential campaign song without his permission, he stopped performing it as a sign of protest. Later, in 1989, he composed for Pixar’s fifth short film Knick Knack. When he conducts orchestras over the world what’s unique is his style of ending it – where the orchestra members sing their musical parts in McFerrin’s vocal style instead of playing their parts on their instruments. He has worked with numerous musicians including the famous MozART GROUP and his performance with them is splendid. In 2009, his work with musician–scientist Daniel Levitin, as the host of The Music Instinct – an award winning documentary, is commendable. Later in that year, at the World Science Festival, he demonstrated the human understanding of the pentatonic scale by dancing, with the audience responding by singing to his movements. And if that’s not enough he is a ten-time Grammy award winner!